Nielsen has begun the process for a possible sale of the business following interest from private equity firm Blackstone Group, according to an article in the New York Post. Blackstone may make a bid for Nielsen tomorrow, in a deal which could value the business at around $10 billion. Founded by Arthur C. Nielsen in 1923, the company was acquired by Dun & Bradstreet in 1984, and then split into two separate companies: TV ratings arm Nielsen Media Research and consumer shopping and box office trends specialist AC Nielsen. In 1999, Dutch publisher VNU acquired Nielsen Media Research, and in 2001 it brought both parts of the business back together under the Nielsen umbrella. In 2006, Nielsen was taken private by a consortium of six firms - including Carlyle, Blackstone and KKR - for about $10 billion; then those firms took Nielsen public eight years ago. Last Autumn, hedge fund Elliott Management Corp acquired an 8.4% stake in Nielsen Holdings, at an estimated value of $660m, with the aim of putting pressure on the Nielsen Board to sell the company. 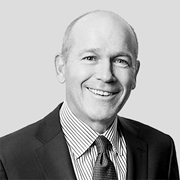 According to the New York Post article, Blackstone - whose Senior MD is former Nielsen CEO David Calhoun (pictured) - is now partnering with buyout specialist Hellman & Friedman to make a bid for Nielsen, and the latter firm's banker JPMorgan has set tomorrow as the deadline for first-round bids. Other possible bidders include Bain Capital, TPG Capital and KKR. Last November, Nielsen hired former IBM exec David Kenny as CEO, following the announcement of a strategic review, which included evaluating alternatives for the entire company and its businesses - such as continuing to operate as a public, independent company; a separation of its Watch and Buy segments; or a sale of the entire company.